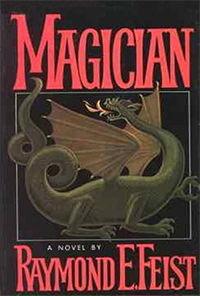 I picked up my first Raymond E. Feist book from the SFBC, Magician by Raymond E. Feist, many decades ago. One of the fun things about the internet is you can google the image of the book you used to have. I haven't kept pace with everything but I have bought a few of the old Midkemia Press gaming books like Carse and Tulan. Recently I even had bought a few more, Jonril and Heart of the Sunken Land. Be sure to check out their website as they even have a few free PDF products. I never played any of the Betrayal series, but I have friends who did back in the day and they loved it. In short, Midkemia as a setting has received a lot of love. In the Legends of the Riftwar series, Raymond E. Feist allows other others to join him in crafting stories set during that time period. In this volume, Joel Rosenberg, best known for his Guardians of the Flame series, to play in the city of Lamut. The novel starts with three different introductions, one for each of the main characters. Durine, Kethol, and Pirojil, are mercenaries who have fought against the Tsurani invaders, the 'villains' of the Riftware series, as well as the 'bugs' in the mountains. Throw in goblins and other humans and what have you and you'll understand that these are seasoned men. The characters are given small arcs to showcase their unique talents but as this isn't one of those mega-novels, their development arcs aren't lengthy or intensely detailed. At the end, the characters are much the same as they were at the start. Durine is a huge ugly individual whose reknown for his strength and size. Kethol is known for his wilderness lore. He is the closest we have to a 'breakthrough' character in that he starts to care about the job and the people involved. Pirojil is the brains of the operation. He sees beyond people's everyday facades and it makes him the one best able to determine who may be a murderer in Lamut. They are hired by the city's Swordmaster to protect one Baron Morray. As outsiders, as skilled outsiders, they are not involved in the many local factions and ongoing issues that the Kingdom itself is going through. Fans of the Riftwar series will enjoy the numerous references to other events in the series as seen from far away and will enjoy the 'guest' appearance of Fantus the drake. 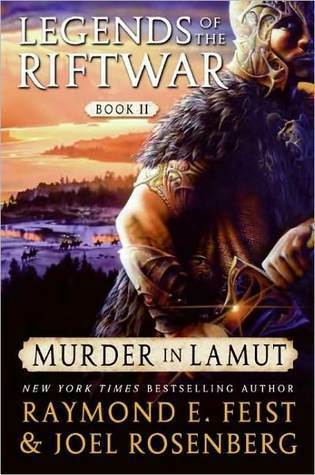 Although some novels in the series are high magic on the order of gods and things older and worse than gods battling, Murder in Lamut is entirely down to earth. None of the main characters are magicians or magic users, and at this point in time, the series hadn't gone to the higher ends involving the magician's guild. This makes it a good read for those who enjoy a little bit of gritty work in their series but take note when I say gritty, I don't mean the subgenre 'grimdark'. There are people working hard and the characters have an earthy feel to them, but one never reads the novel as if this was a work where anyone could die at any second and that life itself was but the stuff of stardust dreams. It's been a long time since I've read any Raymond E. Feist work and even longer since I've read any Joel Rosenberg's work so I can't tell you who wrote which section, but I can tell you that it doesn't feel that it was written by two people. It's a smooth flowing book that a dedicated reader with enough time should be able to finish in a day.